Captain Richard Harvey has been sailing on Lake Superior and around the world since he was 4 years old. With over 45 years of sailing experience Richard will create a truly safe yet exhilarating sailing adventure just for you. 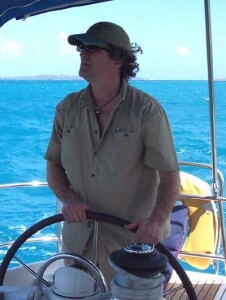 Richard is a RYA Yachtmaster (Coastal and Offshore) and instructor. He holds his transport Canada SVOP and Med A3 designation along with his U.K D.O.T Maritime and Coastguard Agency 200gt endorsement. Richard is also a Dive Master and has been diving in Canada and around the world for over 25years. He is an Advanced Marine and Wilderness Remote First Aid Instructor as well as a Kayak and Canoe Instructor and instructor trainer.